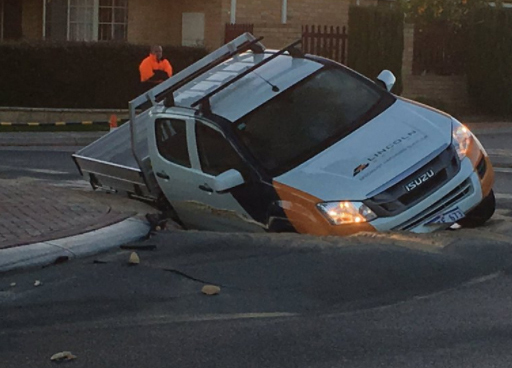 A BURST water pipe has been blamed for the sink hole that engulfed the front end of a ute in Wanneroo this morning. The driver was negotiating a roundabout at the intersection of James Spiers Drive and Loyal Terrace when the ground gave way. The driver was uninjured, but the Isuzu received minor damage. A Water Corporation crew has cordoned off the area, which is likely to remain closed for the rest of the day. A City of Wanneroo engineering team is to liaise with the Water Corporation on the best method of repair.